So I should be upfront about this one. It’s a cheat – because I’m not the instigator of this particular combination – the poet was. And it’s one of his best-loved – although the subject matter is not cheering, it’s certainly all too real. Despite being inspired by a renaissance painting of a greek myth! Like Spencer centuries later (the artist of a previous combo) Brueghel loved to place great historical, theological or mythological moments squarely in his own time and world. Each is obviously set in renaissance Holland with no attempt at historical accuracy. They are old works (to us), but they still speak with undimmed sharpness because it’s as if the artist just peered out of his window and reported his findings. 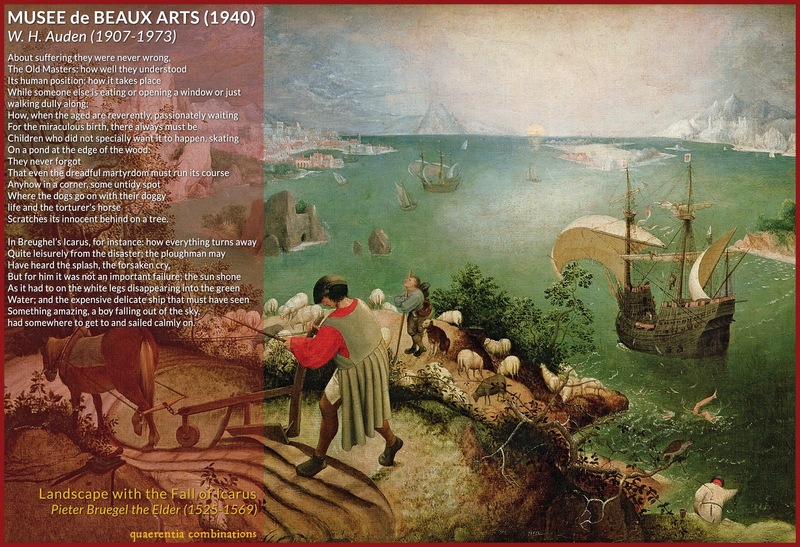 There’s just so much going on (one reason, probably, why Brueghel is beloved of jigsaw puzzle makers)! But what I love about this combination is that Auden has clearly looked – and I mean properly looked – at the emotional details of all this activity so deftly portrayed. The upshot of all of this is that we begin to grasp what both understood about the mundane realities of living in a cruelly broken world. It just carries on. Even if one is screaming, or like Icarus, dying.